Ribs served first time publicly at Family Reunion in Indiana. There is no question that Ribs are America’s #1 Favorite BBQ Meat of Choice. Our thumbs remain Way Up(!) to Grill Masters everywhere- for the time you regularly spend to carefully Season, Marinate and Smoke Pork Ribs to Perfection every day. Our Fathers, their Fathers and thousands of Grill Masters for generations have invested their hearts to make Amazing Ribs more enjoyable every time. We’d never hope, nor expect traditional BBQ Ribs to go away anytime soon. 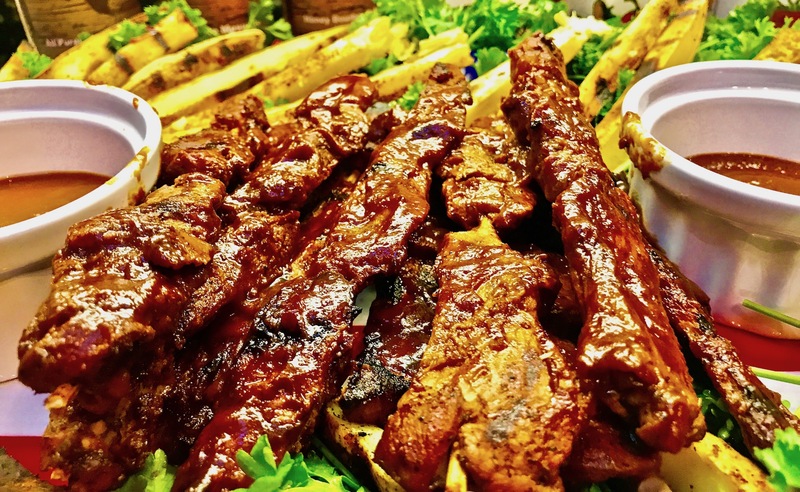 As a Hollywood BBQ Caterer and Private Grilling Instructor, it’s no secret that many Home Grillers can’t come close to making the mighty Ribs we get at America’s top rated BBQ Joints or the succulent Ribs we see on TV’s “BBQ Pitmasters”. So many of you are stuck with reheating the shrink wrapped, pre-cooked, pre-seasoned Ribs we find in most Grocery Meat Departments. Very First Time I tried to experriment with Quicki Lowfat Ribs Recipe, this is how the Skewers looked. I have to give credit for this Recipe’s inspiration to two recent Private Grilling Clients. One in Pasadena- Greg (A Disney Sr. VP of Finance)- was the first to ever convince me teach him my Secrets to Ribs. As part of our Lesson we went shopping and picked up a rack of Ribs for him to marinate overnight, and then smoke the next Day. As an experiment, we also bought a small Pork Loin to see if giving it the same seasoning and smoking the Strips quickly would actually taste like real Ribs. The first Marinade we tried for easier and leaner BBQ Ribs included Worcestershire Sauce, and a blend of Dry BBQ Rubs. We followed the Recipe below, and they came out tasting so good, that Greg wondered aloud why we go through so much trouble with Full Racks. We served the RibLets poolside to his Family and they quickly disappeared. The first time using Greg’s Gas Grill as a Smoker. The Lean Boneless “Ribs” smoked nicely for 8 Minutes per side. On the very first try, we decided to serve RibLet Bites, with BBQ and Jalapeno Hot Sauce as dipping Sauces. Fish dish was for fun nod to Client’s Family’s day at Pool. The next time I made the Recipe was a fluke. I was doing a second Grilling Lesson with Blake Mycoskie (of Tom’s Shoes and Toms Foundation) in his famous Malibu Treehouse Estate. The original plan was to make Beef Ribs on his new Smoker, but while shopping, they were nowhere to be found. Instead, I offered to show him this new Quick Pork Ribs Recipe, and see it if would remind him of Bone-In Ribs. We served them to his wife and son. Once again, they couldn’t believe that the taste rivaled Slow Cooked Ribs. The second time the Recipe was cooked by client Blake Mycoskie (Founder of Tom’s Shoes). They were extra lean and we put Skewers through center for even Smoking. In June I finally had the courage to try the Boneless Ribs recipe at a Sample Tasting for the high powered Board of one of Hollywood’s top Celebrity Financial Consulting Companies. They raved about the Ribs, but chose a different Caterer this time around. However, their reaction gave me the confidence to to try making them for a bigger group. Boneless Ribs sampled at Corporate Board. Food was enjoyed, but they went with different Caterer (this time). So during recent a trip to the Midwest, I served the Recipe at a large Family Reunion in Indiana, and at a private BBQ RESCUES! Foundation #GYMM Benefit, hosted at the home of my sister Marcia and her Husband Lorenzo. The Ribs were a hit at both functions. In the past, I’ve had to give Marcia credit for first getting me interested in learning the best ways to Smoke Foods. Now she earns Bonus Points for teaching me a Shortcut for Grilled Sweet Potatoes [Microwave for 5-7 Minutes before cutting]. Thanks Sis! From there, we recruited True Made Foods and Rubbin’ Right Rubs to sponsor a cooking video- “Quick Low-Fat Smoked BBQ Ribs and Grilled Sweet Potato Fries” for the BBQ RESCUES! Foundation, Inc. To date the Video has over 28,000 Views and dozens of Shares on Facebook. Though their brands are used in the video, you are encouraged to try this Recipe at home with your favorite Dry Rub Seasoning, BBQ, and Dipping Sauces. Link below are some Recipes ideas for your own Homemade Rubs. I am not strong at Math, but by my calculations, there are still Millions of BBQ Lovers who have yet to hear of this Quick, Delicious Low-Fat Alternative to traditional Bone-In Ribs. I strongly encourage you to try this Recipe at home. Share them with Family and Friends. Also, please share your #BBQLowFatBonelessRibs Photos with us on Facebook, Instagram, Twitter, Pinterest, etc… We’d love to see (and hear) how yours turn out at Home. Until next time: Eat and Be Well. Slice Pork into 1 1/2- 2″ Inch Strips (cut against grain as much as possible. Carefully Skewer through Center of Meat as much as Possible, co it stays in Contact on Grill. Smoke Ribs in Low Heat for 20 Minutes, flipping halfway through to get Smoke on both sides. Baste in Foil with BBQ Sauce on both Sides, then quickly char each side on hot side of Grill to sear in juices. If using Wooden Skewers, you makerwant to trim off ends for a more Finger licking Rib Experience. Mick Brown is a Food Blogger/Purveyor based in Los Angeles, with over 30 years BBQ and Grilling experience. Aside from Caterer and Private Grilling Instructor, his passions are creating Easy Grilling Recipes and searching for the World’s Best Flavors. General Manager of Tastee BQ Grilling Co. and Superfood Spice company California Gold BBQ Rubs. In May of 2015, he won Grill Master Champion on Food Network’s Cutthroat Kitchen on special BBQ episode “Grill or Be Grilled” (Season 8, Episode 3). He also recently appeared on Bravo TV, catering for the Cast of Vanderpump Rules (Season Finale). He is also author of web blogs The Adventures of Tastee BQ and BBQ Catering Confidential. His latest media project BBQ RESCUES!, includes a Blog Talk Radio Show, Youtube TV Channel and Podcasts on iTunes. The new Non-Profit BBQ RESCUES! Foundation is sponsoring the #GYMM Program, that does outreach to the Barbecue Community to promote Smarter and Healthier Grilling in the fight against preventable diseases like Childhood Obesity, Diabetes as well as other important Causes. Email- Mick@BBQRESCUES.org.